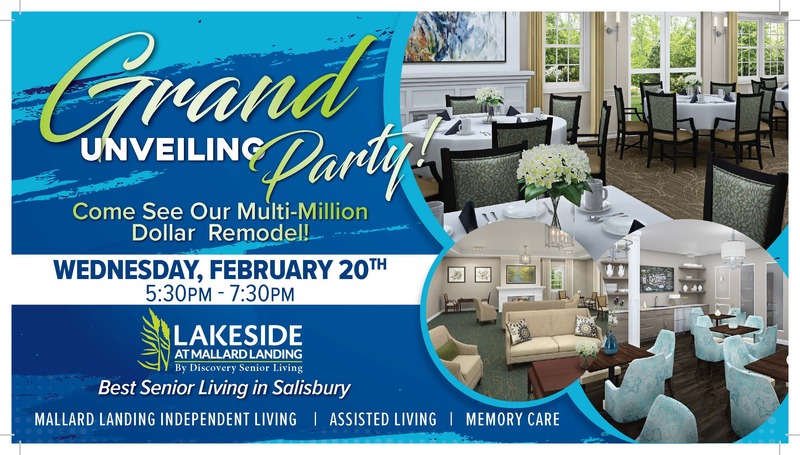 SALISBURY, Md., February 13, 2019	(Newswire.com) - A grand unveiling event is set for Wednesday, February 20th to showcase the multi-million-dollar designer remodel of award-winning senior living community Lakeside At Mallard Landing. The event will be held on location at 1109 S. Schumaker Drive, Salisbury, MD 21804 from 5:30 p.m. to 7:30 p.m. Attendees will get first look at the state-of-the-art community remodel while enjoying live music, a champagne tower, personalized photo-booth, and chef-prepared gourmet appetizers. The remodeled building consists of spacious, nicely-appointed apartment homes, Grand Clubhouse amenities, and access to their signature award-winning Lifestyle Programs: Sensations gourmet dining, Celebrations activities and events, Dimensions health and personalized fitness, Connections transportation, and more. Lakeside At Mallard Landing offers residents worry-free living with activities and event options to preserve an independent, active lifestyle in addition to Assisted Living and Memory Care residences. The community offers residents a continuum of care in the heart of Salisbury, Maryland. Rich in local history and appreciated for its world-class amenities, Salisbury is an amazing area for residents to enjoy their retirement years. Lakeside At Mallard Landing is one of 53 communities across the United States owned, managed and operated by award-winning Discovery Senior Living, an industry leader in first-class senior living communities. Discovery Senior Living is a family of companies which includes: Discovery Management Group, Discovery Development Group, Discovery Realty Group, Discovery Marketing Group and Discovery At Home, a Medicare-certified home health care company. With almost three decades of experience, the award-winning management group has been developing, building, marketing and operating upscale, luxury senior-living communities across the United States. With a flourishing portfolio of more than 8,500 existing homes for seniors, Discovery Senior Living has become a recognized industry leader in creating world-class resort-style communities. The corporate office is located at 27599 Riverview Center Blvd Suite 201, Bonita Springs, FL 34134. For more information, please visit www.DiscoverySeniorLiving.com. and management of award-winning, senior-living communities.